I am seriously considering this type. All the reviews I read online are good but I wonder if anyone in here has tried them. It would be nice to know your impressions. Last edited by Visk; 23-Dec-2017 at 12:17 AM (262). IMHO, I don't think you can go wrong with Pirelli motorcycle tires. My 2015 has them on it. I just got the bike so I don't have a really in depth review for you but they are pretty sticky on dry asphalt too the point that I forgot they weren't true road tires. The front is very noisy 50 mph and up but it tracks well. Have not gotten them off road yet, but delving into the Nav V on the bike, I found the previous owners tracks and he did a good mix of 50/50 riding. Most of the off road riding on forest service roads that are a mix of packed clay, mud, loose gravel and packed gravel and the bike has never been on its side if that tells you anything. The rear is in need of replacement while the front is still meaty. I don't know how many miles are on them but there is about 8k total on the bike. Well its been almost two months. How do you like the Scorpian Rally STR's? i took my chances and tried them on. So i have already run about 1000 miles on them, on road they are amazing, they are loud compared to the anakees but not annoying. No wobbling at all at high speeds, and when it comes to turning... they are amazing. "they are loud compared to the anakees"
the anakees were disgustingly loud. what were Michelin thinking when they designed AND released these tyres. longevity & performance was not great either. the Rally STR are only slightly louder than Pirelli Scorpion Trail II (which are way quieter than the anakees) and nearly as smooth on slick seal surfaces. Just ordered a set. I'll give a review when I get some miles on them. what were Michelin thinking when they designed AND released these tyres. longevity & performance was not great either. 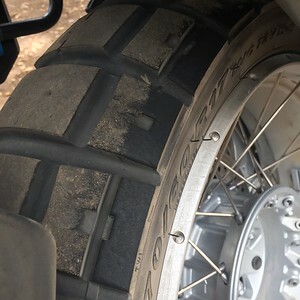 If you're referring to the Anakee Wilds, they were thinking that they wanted to make a tire with as much off-road cred as the benchmark TKC 80 but with longer life - or at least that's what their launch talk was when they released the tire. On that score, they accomplished what they set out to do but at a premium price over the Contis. After running multiple sets of the TKC80s, I've had them on my 1200GS for the past season of off-road riding and they've been as good or better in the schmutz as the TKC 80; just as noisy as hell; and are wearing longer. If you're referring to the Anakee IIIs, they're a relatively simple 80/20 tire with no dual compound construction - about what you'd expect from an OEM tire. They're much quieter than the Wilds or TKC80s and definitely do wear longer and work well in the wet. For you guys who only rarely venture off the pavement, none of these tires are a good fit for your riding including the STR. Just go ahead and put a Roadsmart, Road 5, or similar big bike touring tire on it and it'll be fine for the occasional jaunt off down a gravel road. Last edited by GrayBeard; 02-Aug-2018 at 01:57 PM (789).